To promote her new show 'Glow', Alison Brie attended the #NetflixFYSee For Your Consideration event at Raleigh Studios Hollywood yesterday(May 30th) in LA. 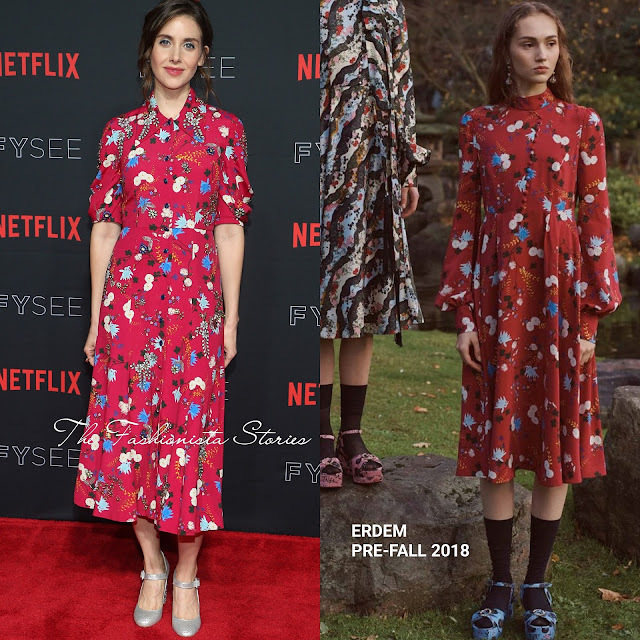 For the occasion, she wore a ERDEM PRE-FALL 2018 long sleeve red printed calf length dress with collard neck and a center front button detail. Alison's exact dress wasn't featured in the look book but it was shown in the same print and a slightly different silhouette. Off-set with grey May Jane pumps, she finished up with an up-do with tendrils and a pink lip. Which version of the dress do you prefer?